This is a roundabout way of approaching an apparently simple question: Why is Margaret Schlegel such an enduring heroine? I hope, though, that it’s a fruitful one, since Forster’s most indelible creation is also his most difficult to pin down. Having raised the impetuous Helen and their bookish younger brother, Tibby, on her own, Meg possesses a mother’s prudence, and yet she’s independent-minded, if not quite radical, in her politics, her cultural interests, her frank language. For her, “proportion”—her catch-all term for convention, which in this dramedy of manners causes the lion’s share of the trouble—is to be relied upon only as a last resort, when “the better things”—kindness, humility, forthrightness, love—have failed. She’s the sort of woman for whom social graces are paramount, and yet believes, with equal ardor, that “discussion keeps a house alive”: She is, in short, the hub of the story’s cross-class connections, the hinge of its conflicts, the hostess with the mostess, the straw that stirs the drink. In fact, Margaret reminds me of Mrs. Dalloway, or To the Lighthouse’s Mrs. Ramsay, and though Virginia Woolf thought Howards End a noble failure, an unformed masterpiece, her own sense of the importance of such women is instructive here. “All these infinitely obscure lives remain to be recorded,” she writes in A Room of One’s Own, meaning the raising of children, the throwing of parties, the packing and unpacking of houses, subject matter that art so often ignores. Woolf’s central criticism of Forster is his use of Margaret (and Helen) to smuggle earnest social commentary into the story—what Thompson and Atwell manage, in their own distinct ways, is to enliven her again, to suffuse the air of erudition in Forster’s writing with the stumbling naturalism of the screen. It’s Margaret’s brightness, her sense of humor, that the performers conjure so convincingly—in the film, as Thompson warbles “the forest drooped glimmeringly,” for instance, or grins at downtrodden clerk Leonard Bast (Samuel West) turning up on her doorstep; in the TV series, as Atwell suggests the merest hint of a smile at Mr. Wilcox’s awkward proposal of marriage, and then caresses him with a gentle cascade of I knows. Coincidentally, Lonergan and Macdonald’s reading hews closer to Woolf’s, tacitly echoing her approval of Forster’s comic chops. With room to breathe, their four-hour adaptation balances the novel’s drama and humor, its romance and politics, more delicately than the Merchant/Ivory film, though perhaps with less punch; the supporting cast—particularly the impeccably detailed, exquisitely funny Alex Lawther, as Tibby, and Tracey Ullman, as the Schlegels’ prim, protective Aunt Juley—is a revelation. (As an aside, neither the TV series nor the film manages to make heads or tails of Forster’s bafflingly precipitous ending. Nor have I.) And yet, whatever his successors do to massage the personalities of those in her orbit, to turn Leonard’s coarse wife, Jacky (Nicola Duffett), into a caricature (as in the film), or lend Henry a warm, genial blush (as in the TV series), there is Forster’s indomitable heroine, as magnetic as ever more than a century on. 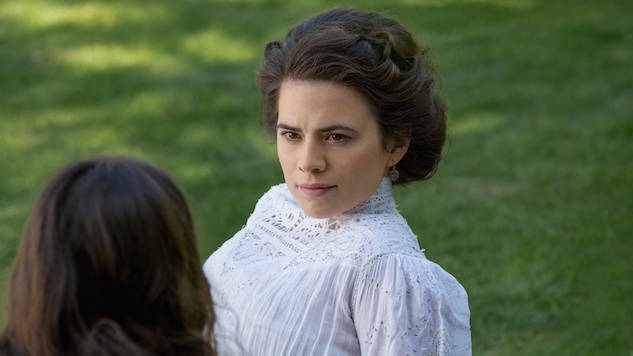 Meg’s continued relevance is a tribute to Atwell, and especially Thompson—I cannot read Howards End without picturing her, and I wouldn’t want to—but I suspect it runs deeper than the screen’s ample charms. There is something to be said, after all, for understanding that convention matters terribly, as Meg concludes, and still to resist it when the situation warrants, when affection demands rights, or right. It’s her refusal to discard her sister that makes Margaret Schlegel recognizable to us—class, convention, and family strife are not specific to Edwardian England, even if their exact shape has changed. It may no longer result in social death, but the sexual double standard remains, and the stigma against single motherhood. It may no longer cause a stir to support women’s suffrage, but there are plenty who look askance at any woman willing to ruffle political feathers. It may no longer be a question of ending the marriage, but the expectation of equal partnership—of forgiving as one has been forgiven—is not always fulfilled. If you’ll allow me a moment of hyperbole, I want to say that Meg is the matriarch of literature’s first, most modern family, at least in the sense that we mean it today: The blended Schlegel-Wilcox-Basts living at Howards End when the novel concludes—Henry, his children, Margaret, Helen, and Helen’s child with Leonard—are as agreeably complicated, in their way, as the Bordelons, the Pearsons, the Pfeffermans, the Fosters. As Helen (Philippa Coulthard) points out in the miniseries’ lovely, sun-spotted epilogue, there’s no uncertain courage in this—to hold the world alight as Atlas did, even at smaller scale. What draws us to Meg, what draws me, is this idea (of Forster’s, of Woolf’s) that such a task might be as immense, and as worthy of note, as joining the mob, running an advertising agency, becoming a drug kingpin, and the fact that she handles it with more grace than any man truth or fiction has managed to fashion. “You picked up the pieces and made us a home,” Helen says, to her sister’s protestations, in the series’ final moments. “Can’t it strike you ever for a moment that your life has been heroic?” As Margaret shows, though she hesitates to admit it, affection is heroic. A useful formula, indeed. Howard Ends is now available on Starz. The film version is streaming on Netflix.